The 2014 Jaguar XLR enters the R lineup as the largest and most powerful with a supercharged 5.0L V8 packing 550 horsepower and 502lb-ft of torque where the XFR, XKR Coupe and XKR Convertible all offer “only” 510 horsepower and 461lb-ft of torque. The 550hp engine in the new XJR is the engine found in the higher end models of the other R line models including the XFR-S and the XKR-S but with the XJ Supersport and Ultimate packages already using the 510hp mill from the other R models, the new XJR had to step up to the R-S engine with bigger power. In the long run, when you consider the fact that the XJ is Jaguar’s top of the line luxury sedan – it is fitting that the XJR would pack more power than the other vehicles in the lineup to receive the R designation. All of that power is funneled to the rear wheels via an 8-speed ZF automatic transmission that has been specially tuned for the new 2014 XJR and the result is a big, brawny luxury sedan that will rip from a stop to 60 miles per hour in just 4.4 seconds en route to a top speed (electronically limited) of 174 miles per hour. More importantly, with extreme amount of testing performed on the famed Nurburgring in Germany, the new XJR will handle every bit as well as it launches thanks to XJR-specific springs and dampers that have been tuned to optimize performance without killing the ride quality that you would expect from a modern Jag. A set of lightweight 20 inch wheels wrapped in high performance rubber make sure that the XJR brakes, corners and accelerates with the biggest names in the global luxury sport sedan segment. "The XJR offers greater steering precision, higher levels of control and enhanced high speed stability, with the trade-off in refinement being very small,” said Mike Cross, Chief Engineer, Vehicle Integrity, Jaguar. “The increase in power and torque give this car truly effortless, seamless performance." Aside from the high performance drivetrain, the 2014 Jaguar XJR features an aggressive front fascia that bolsters aerodynamics and cooling, a vented hood that reduces lift and removes hot air from the engine bay, longer side sills that help stabilize the XJR and a new low profile rear lip spoiler that helps improve rear end downforce at high speeds. Of course, there is also the familiar R badge mounted in the lower corner of the gloss black mesh style grille and on the face of the trunk lid. The XJR is available in 12 exterior colors - Polaris White, Ebony, Ultimate Black, Stratus Grey, Lunar Grey, Rhodium Silver, Cashmere, Caviar, Carnelian Red, British Racing Green and Italian Racing Red. On the inside, the 2014 Jaguar XJR offers a set of exclusive leather race inspired seats with deep base and side bolsters that can be ordered in Ivory, London Tan or Red Zone with more matching leather on the spacious rear seats as well. Beyond those seats, the interior of the XJR is finished almost entirely in black with rick chrome and gloss black accents throughout (carbon fiber is also available in place of the black). In addition to those package specific features, the interior comes loaded to the hilt with high tech luxury items including a digital gauge cluster, a large infotainment touch screen setup, power everything and an 825 watt, 18 speaker sound system from Meridian. The 2014 Jaguar XJR is available in both standard and long wheelbase form with the smaller of the two starting at $116,000 while the long wheelbase starts at $119,000. 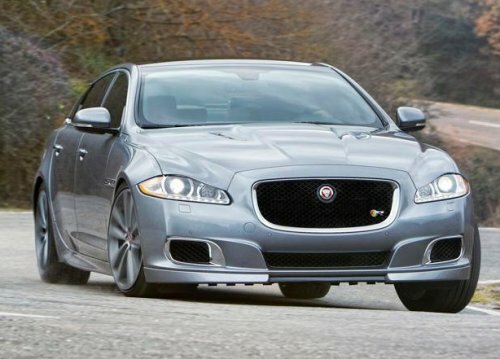 These prices put the 2014 XJR just above the current XJ Supersport ($112,500) and significantly lower than the XJ Ultimate ($155,000) - both of which are powered by the 510hp supercharged V8 from the rest of the Jaguar R model lineup.